The Blue Knights International LEMC is a non-profit fraternal organization consisting of active and retired law enforcement men and women who enjoy riding motorcycles. In the 1974, several law enforcement officers from the Bangor, Maine (USA) area met and formed a small, local motorcycle club. The rest, as they say, is history. The Blue Knights have more than 636 chapters and 20,550 members in 30 countries. 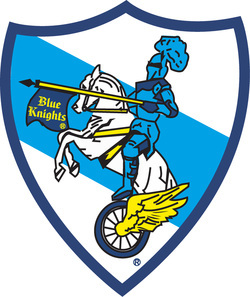 The Blue Knights International was founded in 1974 in the USA, and history in Australia dates back to 1978. We are the oldest Law Enforcement Motorcycle Club in Australia. Adding to that, the Blue Knights is the largest law enforcement motorcycle club in the world with over 20,000 members. In Australia we are referred to as Blue Knights Australia. Members must have or have had arrest powers by statute under national or state legislation, and as such we are pretty exclusive. There are now four Chapters in Australia: Australia I has its chapter office in Perth; Australia II caters for NSW, ACT, VIC, SA and TAS; Australia III administers QLD and the NT, and our newest Chapter Australia IV has its chapter office in the outer metro area south of Perth in the Peel Region, WA. In the membership pack is a Blue Knights International lapel pin, 2 stickers, a membership certificate an International membership card plus chapter specific items. You get access to the national and international forums, and are eligible for a range of discounts at various locations online and around the world, plus a US$3,000 death and dismemberment benefit. The Australian story is one of pride and achievement; Australia joined the Blue Knights family back in 1978 and forged a special place in the history of the Blue Knights legend. With the establishment of the Australian membership and with members in Canada and the USA the Blue Knights became a true international law enforcement motorcycling club and started along the road to becoming the largest and most respected law enforcement motorcycling club in the world. The Australia membership started its humble beginnings in 1978 with some members at large mainly in the Sydney area. In 1982 with support from Washington I Chapter Bob Depeau (founding president) and a current Washington I Blue Knight, and members of the New South Wales Police force started the Australia I chapter. By 1983 Australia I had been chartered and towards the end of the 1980’s the chapter had in excess of 90 regular members and included Police and Law Enforcement Officers from around Australia. This was the first Law Enforcement motorcycling club in Australia and set the bar for all others to follow. Towards the end of 1993 the Australia I chapter disbanded with some members becoming “members at large” and other maintaining their links as members of Washington I chapter. Then in December 2004 a “National Get Together” was organised which took place in Broken Hill, New South Wales and interested Law Enforcement Officers from around Australia attended and a discussion took place that lead to the idea of reforming the Blue Knights in Australia. Then on May 28, 2005 Blue Knights Australia I Chapter was re-chartered by Ray ‘Robbo’ Robinson (president)(who was a member back in the late 1980’s). Initially, the Australia I chapter was managed from Sydney with Directors in all States and Territories. This group structure allowed for state representation and autonomy of rides with National administration being conducted centrally. After a new Board of Directors was elected in 2008, the Australia I chapter office moved to Perth, Western Australia. In 2009, with a significant number of members located in the Eastern states and membership number rising in the West Coast the idea was floated about the establishment of another chapter to allow for the management of the east coast members from the east coast and revert to a more traditional structure of chapters located around the country. This new structure was based on local congregations of members which would service the membership more effectively and also be responsive to the specifics of each state and the Law Enforcement commands within it. The President of Australia I approached 'Boat’ (then current NSW Mob Director) to see if he would be willing to take on the task of establishing a new chapter to include all the states outside of WA. Boat agreed to this and approached certain members of Australia I located on the east coast (Taz & Casper) and recruited others (JP) into the club and Australia II was born. The chapter was formally charted on the 14 July 2010, with Boat (President), Taz (VP), JP (Secretary/Treasurer) as the founding Board of Directors. All of the current members who resided in NT, QLD, NSW, ACT, VIC, SA & TAS were transferred to the new chapter and the new direction for the Blue Knights in Australia was truly underway. Since being chartered Australia II has been growing rapidly and has members in all Eastern states of Australia with large contingents in the Australian Capital Territory, New South Wales and Victoria. As a result of the rapid expansion of Australia II during its first year and as in a similar fashion to why Australia II evolved from Australia I back in 2010, the BoD of Australia II discussed with the Directors from QLD about forming another chapter in QLD servicing members in QLD & NT. So Taz with some of the current members in QLD advised the membership of Australia II at the BAGM at Port Macquarie that they wished to form another chapter. Of course the BAGM supported the establishment of the new chapter with a resounding cheer. And then in July 2011 the Australia III Chapter was chartered and formed by Taz (President), Fonc (VP), Feathers (secretary), Chas (Treasurer), Robbo (QM), Dundee (NT Director) as the initial BoD. The BoD along with members in Queensland and the Northern Territory have formed a strong and well respected chapter in those states. Over the past year Australia III has grown from 19 members when to formed, to 50 members as of November 2012, the strong interest is spurring further membership and we believe it will continue to rise significantly in the coming months and years. In October 2012 Australia IV was formed with 10 members who transferred from Australia I and is located in the Peel District of Western Australia. As the newest chapter in WA it is progressing swiftly and memberships are growing. New chapters are forming in all states and territory's as the established chapters divide due to large numbers or simple geography. If you happen to have an established riding group of 10 or more you can form your own chapter but we always encourage you to start off in one of the established chapters for a time just so you get to know the ropes. But we also encourage the forming of new chapters to serve the local areas. If you are interested in membership contact a chapter office nearest your address to discuss your options. As you do not need to join a chapter in your local area.